Don't you think Tula Pink The Birds and The Bees would make a FANTABULOUS Scrappy Trip Along quilt and of course you would need the perfect Aurifil colors to match. Having recently purchased this Jelly Roll from Fat Quarter Shop ( LOVE THEM) I found the perfect colors to match from Aurifil and WOW!!!!! The giveaway is for one fabulous Tula Pink jelly roll and three large spools of YUMMY Aurifil thread! (the more love the better)!!!!! The giveaway will be open until Jan 7th and a random winner will be chosen and announced by Jan 9th. Good Luck and Happy Scrappy Trip Along!!!!! I AM a follower! Happy New Year! I'm watching the Scrappy Trip Along from afar! Way too much going on right now to start a new project! Oooo yes it would be gorgeous! I've made four blocks but I think I might do 16 blocks and a wide border as I'm much slower than some! I have not joined yet but really want to join. It does seem like a great way to use up some scraps. I have not joined the Sew Along yet, but I think I'll be in, need to practice more quilting! I've been a follower on FB, and also subscribed to RSS. I already follow you on RSS and Facebook! I believe you are on twitter too, and I follow you there also. I am just a stalker! I haven't jumped in yet but I've seen everyone's lovely blocks on Instagram and I'm tempted! And I follow your blog in my google reader. I've made 8 blocks so far. I was trying to follow a color pattern for all my blocks, but I am running out of purples! I follow you on FB. I have not joined the quilt-a-long but these fabrics and thread are oh-so-tempting. I love it all together! Haven't joined the quilt a long. It's very tempting, but I , like everyone else, have other projects on the go. Will take another look and may cave in and join in. Thanks for the chance to win great prizes. I have not joined the quilt along, but have to think about, it would be fun. Love this block. That is my next project. I should join, but i haven't yet. 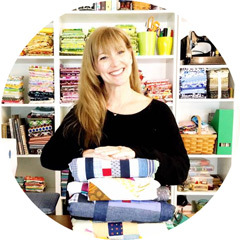 I havent joined the scrappy quilt along yet cause I am "dedicated" to finishing up some projects this year but would do love the jelly roll and of course, the auriful thread which I use exclusively for my sewing. Like you on FB and would like to make my first quilt soon. I haven't joined yet but this just might convince me to and I'm going to drive by the LQS today so this would be a good reason to stop in. Haven't joined yet but I'm strongly considering it. Always wanted to learn to quilt. Right now I crochet and knit. I have only recently become a fan of scrappy. It used to be too loose for this ultraconservative by the book rule following girl, but something inside me was begging to be let go and scrappy is it!! I so love this scrappy trip around and it is so me now. I also just started to follow you. I love aurifil thread and I could so see this quilt in that jelly roll. I'm currently making a trip using 1 1/2" squares (I'm nuts! ), but I want to do a larger one, also. thanks for the chance! I have not started it YET, but probably will. love the idea of using a jelly roll! I just pop over the link and what a great idea... I am starting to think what fabrics I can use, some scraps some stash.... Thanks for the chance to win! Following! Thank you for the giveaway! I'm seriously considering joining the scrappy trip. Add me to the stalker list, GFC, FB. I am one of those followers who can't take the chance of missing anything. Happy New Year! Here's to an amazing 2013! I would like to join the Scrappy Trip Around but can't figure out where to go to do that. Please tell me! I have joined the Scrappy Trip Along...may take a year to complete though! I just signed up to follow your blog! I've been salivating over the blocks popping up on Instagram, but haven't tried it yet. Maybe soon! I am a follower, of course! And I follow you via google reader. I'm not able to join the scrap-a-long, but I am a follower and here is a New Year hug ( ) plus best wishes for 2013. Love those colors or the jelly roll & the Aurifil! I am always looking for inspiration, and I believe you can never have enough friends, so here I am becoming a friend and enjoying your creativity! I also believe a quilter can never have enough fabric or thread! I haven't joined in the fun ...YET, but I am really sorely tempted. I think it would be a great way to do an leader ender project for this year for me. I like to have one going all the time and this would be a great one. Brilliant way to use up scraps too!! Oh and pick me for the jelly roll!!! I did join the group as it looks like a wonderful way to use up some scraps. Happy new year...I am a follower. Love your blog--I'm a follower! I haven't joined yet, but it seems like everyone else has! I swear I've seen it on at least a half dozen blog posts in the last day :) My scrap bin is getting full... perhaps this would be a good way to digest some scraps! Started my first block today! I love this jelly roll and thread. I am a follower. Many hugs to you! Hmm- haven't jumped on the bandwagon yet but want to! It's too much temptation watching you all on Instagram! Thanks for the chance- I Love this line! Tula and thread ! Pretty great hook, and I do love to make use of my scrap bin. I'll finish my current and then catch up. I'm a new follower! Thank you! I have not joined the Scrappy Trip Along. Not yet sure if I will. Work has really got me hopping. I started cutting for one yesterday! Mine's going to be in primary colors with a few random scraps thrown in - here's hoping I get to start some sewing on it tonight - I can't wait to see what it's going to look like. I follow on facebook and in google reader. You are right. I do want to but I want to start too many new projects at once. Need to narrow it down! I need another project like a whole in the head, but wow! This looks like fun, I'm in! I just found your blog, LOVE it! I follow on my google reader! I haven't made any blocks yet, but I can feel myself getting sucked in to this craze. Winning this jelly roll would be just what I need to get me started. I have fallen under the spell of the scrappy quilt along... I won't be back home until the 7th, but I have been bitten! I follow your blog. Thanks for the chance to win and Happy New Year!! I am a FB follower and Google Reader as well. Happy New Year! I have not joined yet, but keep looking at it! I just started following you! I haven't started quilting yet. I'm still looking and wishing. I just became a follower of your blog! Sending you big (((((((((((((((((((HUGS)))))))))))))))))))) for the New Year! Happy new year! I don't think that I will be able to join, but surely I will follow what is going on. I was literally just looking at this jelly roll at Craftsy and thinking it would be perfect for this quilt-along. My college son is still home, so I am delaying any new starts until he heads back. I am very, very tempted!!! Thanks for the wonderful giveaway chance! I am a happy follower and wish you a happy new year with lots of creativity and special moments! I am a happy follower of your blog - Happy New Year! I love to sew scrappy. Was just looking for your scrappy quilt along and was not able to find it. I have become a follow, because I saw several patterns that I would like to try. Here is a New year Hug for you. Oh yes, I've joined. Bit of a scrap vomit but I think it's going to be an awesome picnic quilt! Happy New Jear and I ,m a Follower.. and I love love this yelly roll . makes me think SPRING! so beautiful! How wonderful, I haven't tried Aurifill yet! I haven't joined the scrappy trip-along because I have TOO MANY WIPs! I'm already a blog follower! I saw your post on Facebook and now I'm a follower on there (Crystal Gregg) and on bloglovin. And I have too many current projects to make and not enough scraps for the Scrappy trip Along... Maybe one day! I'm a follower and since I'm on a food as well as a fabric diet...scrappy trip is in my future! I just discovered the QAL and I love it! I am going to join! thanks for pointing it out! I am a new follower-what an awesom giveaway!!! LOVE! I'm a new quilter and am looking through my fabric stash in preparation of joining the Scrappy Trip Along. I'm a follower! Thanks for the awesome giveaway! I'm on the fence about joining, I have three quilt tops that need to be finished. Happy new year. Eg har aldri sytt noe av stoffrull-stripesett,så det hadde vore spennende i 2013. Joined in on the scrappy. Now to get busy! I haven't joined the scrappy trip along yet, but this could certainly change my mind. I love Scrappy quilts. ---and I love MAKING them too. I'm a follower! Happy 2013! Eg er din Norske blogvenn,og er ofte innom deg! I have not officially joined yet, but I am sure watching with interest from the sidelines and might just have to jump in soon! Thanks for the chance! I have joined the Scrappy Trip Along! I haven't joined yet, but I don't think I will be able to resist temptation much longer! up~~this would be a great gift!! I am joining the Happy Scrappy Trip Along!!!! Girl, you know i'm already in on the scrappy trip along! I'm fighting the temptation to start a second one! Awesome way to use up my scraps...I'm all in!! And I'm a follower, too! Oh how pretty! I am a follower! I want to join, but I have to finish my scrap vomit quilt first. I'm going to try it! I'm following you with Google Reader! I have joined the Scrappy Trip Along. I will be joining the scrappy quilt along in the very near future... Just have to finish up my current project! I haven't yet but I am certainly thinking about it. I am in the QAL. Love it and live this giveaway!! I'm going to do the scrappy trip along. I am an email follower. I am a happy regular follower of your blog. Happy New Year! Lawson made me join!!! And of course I follow you!! You are right I WANT TO! Would help reduce my scrap stash! I am a New Follower! Thanks! Can no longer resist, will be cutting into my scraps today. I am a follower. Big New Year's hug . I am a new follower and am going to be joining the scrappy trip along soon! I have started on it, but i'm not going to join the group. I'm bound to be the last person to finish! I like just secretly following and going at my own, incredibly slow pace! I am already a follower of your lovely blog. Happy New Year! I DID join the Scrappy Trip Along! I have been wanting to make a quilt like that for a long time! I am taking part in the Scrappy Tripalong. This is my first quilt so I am pretty excited! I am a follower and plan to join the Scrappy Trip Along. Here is a New Years ((HUG))! I have been watching from the sidelines so far, ogling all of the beautiful quilts that are being posted. I was *this close* to starting one up but I really really really need to work on other stuff right now. It is definitely still on my radar and will most likely happen sometime soon, lol.